Butler senior Alexis Leech only joined the girls track and field team last year as a junior. In a short time, the University of Pittsburgh recruit has developed into one of the best runners in school history. BUTLER TWP — Alexis Leech had no inclination to join the Butler girls track and field team. Leech had a class with former Butler track and field great, Annessa Schnur Steele, who planted the seed for Leech — tall, lanky and athletically gifted — to give track a try. Former Butler head track and field coach and current Tornado girls assistant coach Mike Seybert, a teacher in the high school as well, also had her ear. So Leech joined the team as a junior. Leech has adapted quickly to her new sport. 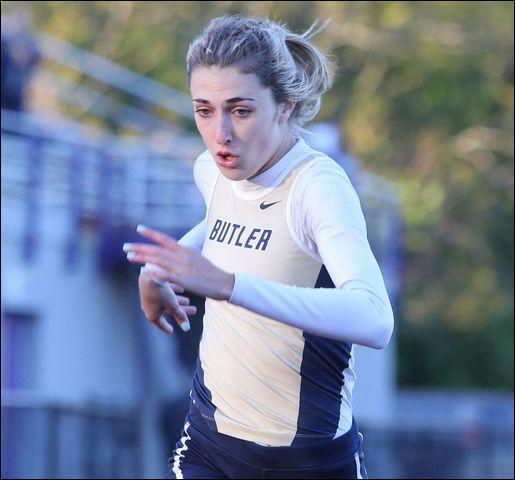 In less than two years she's developed into one of the best track athletes in Butler history. Leech recently broke a 19-year-old record belonging to Steele in the 400-meter run. Leech ran a time of 55.53 seconds at the Baldwin Invitational, breaking the mark of 55.9 set by Steele in 1998. That record was one of the first goals Leech set for herself once she settled into the 400 as one of her main events. The first time she ran the 400 as a junior, she posted a time of 1:07. Now she's in the mid-55s. Leech also runs the 200, the 800 and runs legs on Butler's 3,200- and 1,600-meter relay teams. She doesn't mind the heavy workload. The 400, though, is her niche, even though she has a love-hate relationship with it. Butler girls track and field coach John Williams said it's difficult to describe what Leech has meant to the team the last two seasons. Leech, who will run at the University of Pittsburgh next year, helped the Golden Tornado to section and WPIAL championships this season. “I don't know if I've ever seen anyone like her,” Williams said. “I mean, she can just go. When it's time to go, she just goes. She's just scratching the surface on how good a runner she can be. Pitt's getting a gem with her. Leech has also been blessed with teammates such as Liz Simms and Maddie Tonini who have pushed her in the 400. The trio have the top three times in the county this season in the 400. Leech is hoping to cut even more time off her mark in the 400 at the WPIAL Track and Field Championships Thursday at Baldwin. Leech admitted the key for her is not thinking about it too much. Just go out and run, she said. “And win everything,” Leech added.